TWO big-hearted brothers from Leigh who have financed and built multi-million-pound accommodation for local people in crisis have been nominated for an All-Party Parliamentary Corporate Social Responsibility Group Award. 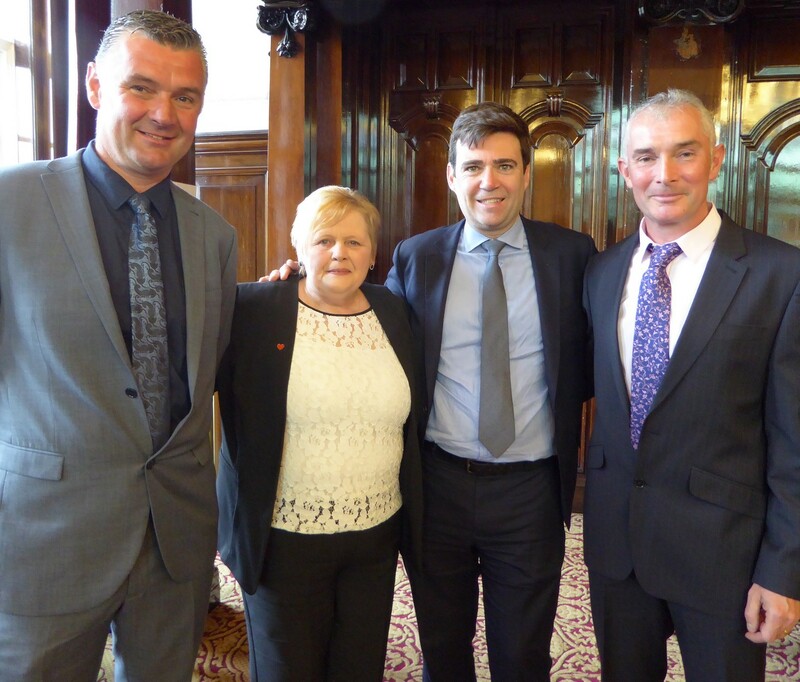 The announcement was made by Andy Burnham MP at Leigh Town Hall on Friday evening at our special reception – held in honour of David and John Patrick, Directors at Patrick Joinery Ltd – and attended by Lady Joy Smith, the High Sheriff of Greater Manchester. Having purchased Boardman House (the former tax office on Leigh Road) in 2011, the brothers worked with us to transform it into a residential and community hub (named ‘Patrick House’) at their own expense. They then built a neighbouring well-being centre, Haven House, as well as Duva Mews (a row of smart new houses for people with learning disabilities), which opened this year. “None of us can be sure what life will throw at us,” said Greater Manchester Mayoral candidate Mr Burnham. “You need a place like Compassion in Action, which – in a non-judgemental way – helps people who have experienced crisis to put the pieces of their lives back together and move on to the next phase. ‘I am the luckiest person in Parliament to represent a town like Leigh, where people don’t just see success as a means of escape; they use success to give back to others. David and John, I know you do not do what you do to seek praise, but there comes a moment where you deserve recognition. Our tearful Chief Executive Officer, Pam Gilligan, added her personal thanks to the ‘utterly remarkable’ Patrick Brothers, who were born and raised in Tyldesley and attended Fred Longworth High School. “David and John’s belief, dedication and hard work turned a once derelict building into a first-class facility, with accommodation for our Recovery Academy residents, a community café, function room and offices,” she said. She also praised other local contractors who had generously donated time and materials to support the ground-breaking build, including Regency Glass, SP Smith Electrical Contractors, Collins Building Solutions, Lakes Plumbing and Heating, and SLD Roofing. John, aged 48, of Atherton and David, aged 45, of Green Lane, started their property empire in 1992. They first met Pam nine years later – beginning their long-running association with our charity. The reception concluded with a special buffet for 30 guests – prepared by residents of Patrick House.